Alex Ribeiro (BRA), 25, came from behind in the Final to defeat Jeremy Flores (FRA) by a score of 14.93 to 14.17 at the 2015 Quiksilver Pro Saquarema presented by Powerade. With his victory today (Sunday), Ribeiro received U$ 40,000 in prize money and 10,000 World Surf League Qualifying Series points. After starting off the competition in 57th place on the QS ranking, Ribeiro catapulted up to 2nd place as a result of his performance. 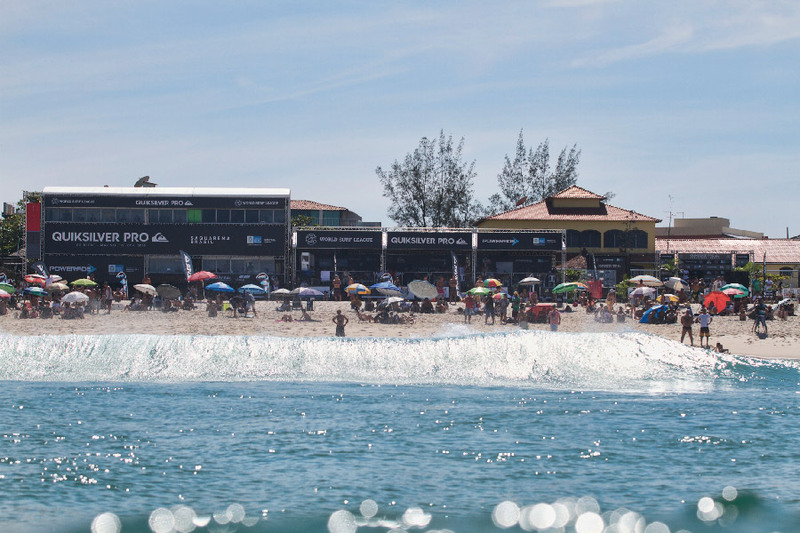 In addition to the event win, Ribeiro also received the last wildcard position available for the upcoming Samsung Galaxy Championship Tour event, the Oi Rio Pro at Barra da Tijuca, which begins on Monday. Flores jumped to an early lead in the Final after scoring an 8.60 on his best wave and a 5.57 on his back up. However, Ribeiro’s composure paid off and with 10 seconds remaining in the heat, he paddled into his last opportunity and blasted a combination of huge hacks to leap into first place and straight to victory. Flores has been on a torrid streak in May. He started off the month with a 2nd place finish at the first QS 10,000 ranked contest of the year, the Oakley Lowers Pro, in California. After succumbing to Filipe Toledo (BRA) at Trestles, the experienced Frenchman quickly packed his bags for the long flight to Brazil for the Quiksilver Pro Saquarema. 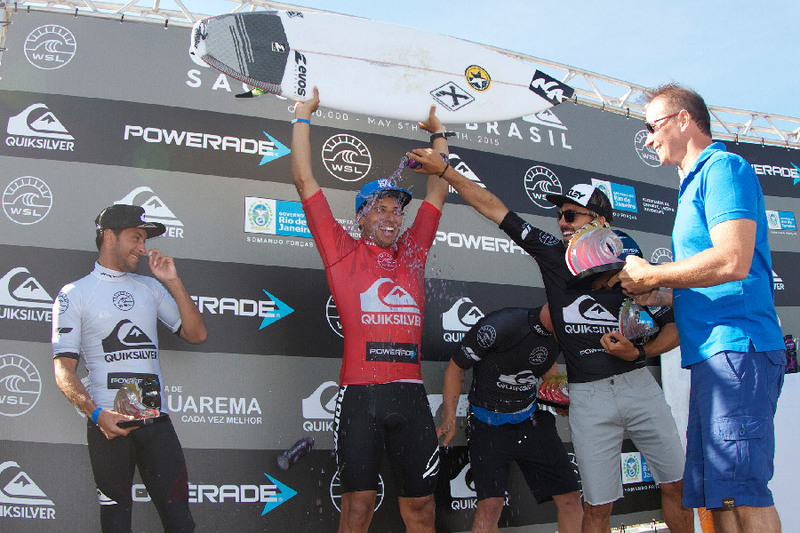 Flores showed solid form throughout the competition and guaranteed another substantial result at Praia de Itauna. The setting for the final day of action at the Quiksilver Pro Saquarema was spectacular. Warm weather, sunny skies, light winds and rippable waves in the 3-4 foot range (1-1.5 meters) were on hand for the outcome of the 2nd QS 10,000 event of the year. The day began with the remaining 4 heats from Round 4 before competition segued into the Quarterfinals. Yesterday, Ribeiro eliminated Italo Ferreira (BRA) in Round 4 before defeating Nate Yeomans (USA) in the Quarters, Noe Mar McGonagle (CRI) in the Semifinals and ultimately prevailing over Flores in the Finals. Flores had an even longer route to the Finals after having to compete in Round 4 to begin the day. He began by beating Jesse Mendes (BRA) in Heat 8 of Round 4. He then displayed his powerful surfing over the lightening-quick surfer from Costa Rica, Carlos Munoz. In the Semis, Flores scored an 18.17 heat total to take down Caio Ibelli (BRA) before claiming his second runner-up finish in as many contests. Things have shaken up on the WSL QS rankings after completion of the 2015 Quiksilver Pro Saquarema. Only the Top-10 ranked surfers on the QS at the end of the year will qualify for the 2016 WSL Championship Tour (CT). Four new surfers have moved into eligibility. Alex Ribeiro (BRA), Ryan Callinan (AUS), Caio Ibelli (BRA) and Noe Mar McGonagle (CRI) have moved into the Top-10, while Michael Rodrigues (BRA), Michael Dunphy (USA), Wade Carmichael (AUS) and Charles Martin (GLP) have moved down in the rankings. McGonagle looked impressive throughout the competition by exhibiting a powerful, yet polished, style of surfing. The young Costa Rican was ecstatic after earning a Semifinal result at the Quiksilver Pro Saquarema.